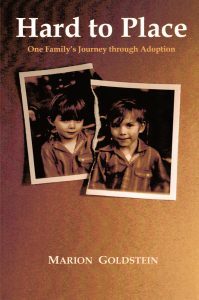 On a freezing February morning in 1971, in Yarmouth, Nova Scotia, the young boys who would become my sons were rescued by the Canadian Mounted Police from a childhood of overwhelming desperation and neglect. Only two and three years old, my sons do not remember that the door was unlocked and swinging on its hinges, and the only adult at home lay unconscious in a downstairs bedroom. They do not remember the broken jar of peanut butter that they scooped from in their crib, or the sores on their buttocks or the feces in their hair. They do not remember the shattered window in the attic room next to the crib, or the way the light gave way to dark every twelve hours. They do not remember the little girl with matted hair their sister crouched in the doorway, destined to find them twenty five years later. They did not know that their names were Eddie and Kurt. The social worker who took them to a place where they were bathed and fed, as well as the doctor who documented the emptiness behind their blank stares and the malnourished smallness of their rigid bodies, are both beyond memory. Kurt does not remember his trip to the hospital for the hernia that the doctor found and his terror of the medical staff who tried to quiet him. Eddie does not remember his panic at being alone, without the brother with whom he lived behind the bars of a dirty crib. It wasn’t until nearly twenty five years later that I was able to piece together what happened to them during those early years, between May of 1967 and February of 1971. Reports from the only social service agency that existed in that small fishing village, a packet of letters from their foster mother, and patches of Kurt and Eddie’s memories were all we had to go on. When their adoption file was finally unearthed from a Division of Youth and Family Services warehouse in New Jersey in 1997, the full extent of their deprivation as babies was revealed. Confronting and understanding truths long hidden has been an important step in the process of healing the deep, pervasive wounds of the past. Several weeks after removing Kurt and Eddie from that attic room, the Canadian Social Service Department placed them with Ardis and Allen Morton, a young childless couple in Yarmouth. The courts had acted on the county’s petition for protective custody, and a young social worker, Heather, made the children her cause. Piling them into her station wagon, she brought them to the little red house on a secluded tract of land on the outskirts of Yarmouth. Kurt and Eddie were the first of dozens of foster children whom Ardis and Allen would parent during their marriage. Good and simple people, they’d tried to conceive a child of their own, but Ardis was unable to get pregnant. As foster parents, they were prepared to take care of children, and perhaps eventually adopt them. Allen had an eighth-grade education, and worked with the maintenance department at the local hospital. When not at the hospital, he did forestry work in the timberland that surrounded the town. Ardis, who had completed ninth grade, remained at home and was looking forward to having children in the house. The boys’ first memory of their life as foster children was of Baron, the watery-eyed Labrador who came running down the icy patch of driveway in front of the little red house where Ardis and Allen lived. They each remember Baron as an instant friend, wagging his tail and nipping at their mittens as if to say, “Come and play.” He dashed ahead, leading them to the doorway. Inside, the house was warm and neat. Neither of them could believe it whenArdis showed them a cardboard box stacked with plastic trucks and a rocking horse standing next to it. Neither of them had ever had a toy of his own. Kurt even remembers the dried flowers, probably gathered from a nearby field the previous summer, arranged in a glazed pot on the kitchen table. Ardis took Eddie and Kurt and their little bags of belongings to the room where they would sleep. It contained a set of bunk beds where they would be tucked in each night under clean sheets and warm blankets. A window across from the bed was covered with cotton curtains. Beneath the curtains was a piece of clear plastic, pulled taut over the window and nailed in place to insulate the room from the cold. When warm weather came, Allen removed the plastic, and the boys were able to look out onto the huge trees and canopy of sky and stars that surrounded the house. Across a narrow hall was another bedroom where Ardis and Allen slept. The doors between the rooms were left open. At night, the soft murmur of conversation mingled with voices from the TV floated from the living room into the boys’ room as they huddled with each other in the bottom bunk. These were the first images laid down like a plank in the scaffolding of memory around which the boys would construct a past. The architecture of a safe life was slowly being erected. The trail into the woods that surrounded the house and a shack standing in a nearby cow pasture were two more images built into the fragile structure of their early memories. Here, the boys played with their little red plastic hammers amidst mufflers retrieved from worn-out trucks and tires waiting to be discarded at the dump. Rusted lawn mowers and an old washing machine were strewn in the high grasses, and the boys used their tools to fix them. Outdoors was their playhouse. Here, alone together, with cows mooing all around, they found a thin lath of happiness and nailed it down in memory. Allen took the boys fishing. He taught them how to tie a string to a pole and bait the safety-pin hook with the fat bloodworms that emerged from the ground each evening. Every now and then, one of the boys would manage to haul in a catfish, and Allen would clean it and cook it for supper. Sometimes Ardis took them beyond the pasture, deeper into the woods, to watch Allen at work. They followed the sound of the chainsaw and the trail of stamped down foliage that Allen and his friends had worn into the forest. Coming upon their foster father in the woods was both exhilarating and frightening. Trees were falling! Kurt and Eddie waited in the clearing, clutching Ardis’s hand. After the long groan of the pine as it fell to the ground, the boys ran to Allen and quickly handed him his lunch-pail, before running back to the safety of Ardis. Sometimes they sat with Allen for a few minutes in a bed of pine needles as he ate his lunch, before he picked up his ax or buzz saw and headed for the next tree. KURT AND EDDIE RARELY LEFT HOME. Occasionally they’d be allowed to ride to the dump in the back of the old pickup truck. They sat amidst the refuse, bumping down the gravel driveway onto dirt roads twisting into the hills, the wind blowing through their hair. Ardis watched them from the cab as they clung to the sides of the truck. “Hold on tight,” she shouted as they giggled and shrieked with excitement. At the dump they each loaded up with a portion of the week’s disposables and made a little procession from the truck to the huge swath of valley that swallowed and digested the town’s garbage. Allen grasped the collars of their shirts or jackets so the force of the throw would not tumble them into the pit. Trips to the hospital—the only other times the boys left the little red house on a regular basis—were less fun. They did not like the hospital, with its maze of corridors and people. They did not like the long hours with the psychiatrist, or the small testing room where each of them went separately. They did not like the tiny table or chair where the doctor sometimes squeezed himself so he could sit opposite one of them to play a game that was really not a game at all. Even the ride was less fun. Ardis and Allen told them to squat down in the back of the pickup so that no one in town would see them. They made a game of it: each time Allen slowed down, Ardis told the boys to pull the old wool blanket they kept in the bed of the truck over their heads. The explanation for this secretiveness was another piece of the puzzle that lay hidden in a sealed file for the next twenty five years. Sometimes peeking from under the blanket, the boys watched Ardis buy fish from one of the many markets that lined the harbor street. Nova Scotia is a 350-mile-long peninsula protruding into the Atlantic Ocean like a giant lobster claw dangling off the Eastern Coast of Canada. Yarmouth is located at its southernmost tip. Here Kurt and Eddie could see the Atlantic coast and the seawall rugged with rocks. They were fascinated by the bracelet of lighthouses that wrapped around the coast, casting beams across the water for the many fishing boats that entered and exited the tiny port. One afternoon, standing on an empty beach, the waves lapping at their toes, the boys looked out at the great expanse of ocean that covered the whole horizon. Allen was pointing out the ferry docking in the harbor. He explained how it sailed for ten hours each night to transport tourists and their cars from Bar Harbor, Maine, in the United States, across the water into Canada. Of course, the boys did not understand this geography, only that the other side of the ocean was very far away. It was the spring of 1971. Small as pebbles against the blue stretch of ocean, the boys breathed the sea air they would never forget. Small for their age, each boy looked about a year younger than he was. I imagine them standing together, shoulders touching through their washed cotton shirts, their hair, fine as corn silk, covering each head like a copper bowl. During that Spring, while the sons I had not yet met were beginning to take their first tentative steps towards recovery from their traumatic early childhood, I was living in New Jersey. I can picture myself as I was then, deep in thought, folding laundry in the basement or standing at the kitchen counter spreading peanut butter and jelly on Wonder Bread. Robert, Kathleen, and Dennis, my three children, would come banging in the side door each day, hungry for lunch after a morning at school. I was completely unaware that during those very days, providence was entwining my life with the lives of two little boys in another country who stood gazing at the sea.